The fine weather at the Drainage for Dairy event organised by Aurivo and Teagasc, encouraged a large attendance on the Walsh family dairy farm on Tuesday last. 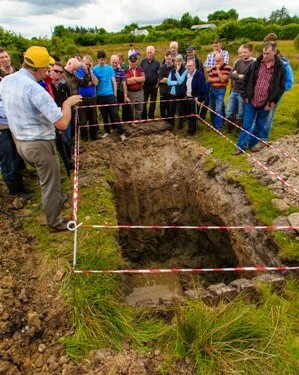 This was the first large event for the Aurivo Farm Profitability Programme in conjunction with Teagasc. Over 200 people attended on the day to hear about the Walsh family’s experiences with drainage over the years, the challenges they faced and their plans for the future of their farm in Knock, Co. Mayo. The Walsh family are one of the 1,000 Aurivo milk suppliers and local Teagasc client’s of Peter Comer, and are focussed on running a profitable and comfortable dairy farm. On a 43ha farm, the Walsh’s are now very familiar with the trials and tribulations of land drainage and the reasons they outlined for going through with it is to grow more grass for their 117 cow dairy herd. On the day farmers travelled from all over the Aurivo region coming from Sligo, Mayo, Galway, Roscommon, Westmeath and Offaly to hear from the Walsh’s and research experts. Mayo advisor Brendan Garry introduced the farm with Jarlath Walsh outlining the potential and current performance of the farm. 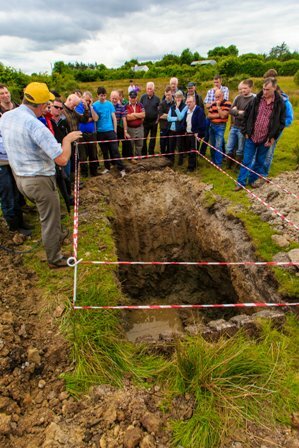 James O’Loughlin who works on the Heavy Soils Programme with Teagasc outlined the steps to take when considering your drainage system by demonstrating the dynamics of soil with a test pit on the day. Mary McEvoy a Teagasc researcher on grassland varieties and reseeding discussed the importance of managing the paddocks after drainage has been carried out, also outlining the role of clover in the sward. On the final stand Westmeath advisor Patrick Gowing discussed the costs of drainage and the importance of getting in right, while Danny Walsh discussed their own experiences with costs and what they had carried out themselves. As the stands and speakers concluded there was a demonstration from a land-drain flushing machine in the freshly maintained open drains on the Walsh’s farm. The key messages from the day were to thoroughly examine the type of drainage for one’s farm as the costs are high, look at what is already in place and if it can be maintained, or can ‘better’ land do more. Teagasc and Aurivo thanked the Walsh family for hosting the event.